The global automotive power electronics market is gaining from the rising sales of electric vehicles for environmental considerations. Several governments in the world are encouraging the adoption of electric vehicles as they do not emit harmful emissions that are detrimental to the environment. For instance, in the U.K, the sale of petrol and diesel cars is anticipated to be banned by 2040 as the government is undertaking consistent efforts to improve the air quality. Apart from this, thrust to equip vehicles with advanced power solutions is stoking growth of automotive power electronics market. This includes advanced driver assistance systems and convenience systems to enhance vehicular safety and to track vehicle in real-time. 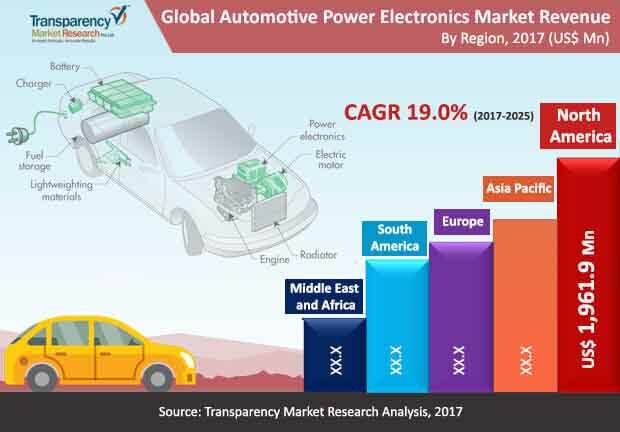 A report by Transparency Market Research (TMR) projects the global automotive power electronics market to clock an impressive 19.0% CAGR between 2017 and 2025, for the market to reach a valuation of US$22,658.4 mn by the end of 2025. The global automotive power electronics market is segmented on the basis of electric vehicle, vehicle type, application, and geography. On the basis of electric vehicle, the segments of the market include battery electric vehicles, hybrid electric vehicles, and plug-in hybrid electric vehicles. Amongst them, in 2016, the hybrid electric vehicles (HEV) segment held the leading share of the market as it plays a key role in decarbonizing the transport sector and in reducing dependence on fossil fuels. Going forward, the hybrid electric vehicles segment is likely to hold a key share in the global automotive power electronics market over the forecast period. However, plug-in hybrid electric vehicles (PHEV) is projected to expand at a relatively significant growth rate in the automotive power electronics market over the forecast period. On the basis of vehicle type, the global automotive power electronics market is categorized into passenger cars (PC) and commercial vehicle (CV). Of the two, the passenger car segment is anticipated to account for the leading revenue contribution expanding at a significant CAGR during the forecast period between 2017 and 2025. The growth of the passenger car segment is mainly because of government initiatives for equipping advanced electronics in passenger cars to minimize environmental pollution. Further, upcoming safety rules are anticipated to mandate installation of automotive safety technologies and security features in passenger cars. The emergence of advanced driving assistance technologies is leading original equipment manufacturers (OEMs) to equip passenger cars with efficient power electronic components. The global automotive power electronics market is segmented into powertrain and chassis, body electronics, safety & security systems, infotainment & telematics, and others based on application. Amongst them, the body electronics segment is anticipated to account for the leading share in the overall market vis-à-vis value and volume. On the other hand, the safety and security systems is anticipated to witness significant growth during the forecast period on the back of government initiatives for safety and security norms in the transportation sector. Geography-wise, the global automotive power electronics market is bifurcated into North America, Asia Pacific, Europe, the Middle East and Africa, and South America. Asia Pacific, amongst all, is anticipated to display the leading growth rate of 20.3% between 2017 and 2025. Europe, on the other hand, is anticipated to display second-leading growth rate owing to government initiatives that encourage adoption of smart transportation solutions. Prominent participants in the global automotive power electronics market include Infineon Technologies AG, Texas Instruments Inc., ON Semiconductor Corp., Renessa Electronics Corp., Mitsubishi Heavy Industries Ltd., Maxim Products Inc., NXP Semiconductors N.V., Qualcomm Ins., Robert Bosch GmbH, and Vishay Intertechnology Inc. This report on the global automotive power electronics market provides analysis for the period 2015–2025, wherein 2016 is the base year and the period from 2017 to 2025 is the forecast period. Data for 2015 has been included as historical information. The report covers market dynamics including drivers, restraints opportunities, and trends expected to influence the global automotive power electronics market growth during the said period. The study provides a comprehensive analysis on market growth throughout the above forecast period in terms of revenue and volume estimates (in US$ Mn & Mn Units), across different geographies. The advent of high frequency and high power switching devices has brought about a comprehensive application of power electronic converters for conversion of energy and motion control. Increasing installations of advanced driver assistance systems, rising preference of vehicle electrifications among power electronics equipment manufacturers and Tier I suppliers, and stringent automotive safety and security regulations introduced by the government in order to reduce environment pollution are the major driving factors fueling the growth of the market. Rise in demand for electric passenger vehicles and light commercial vehicles from the developing economies such as China, India, and the Latin American countries (Brazil and Mexico) is expected to drive the market during the forecast period. However, high cost associated with electric vehicles is anticipated to hinder the growth of the power electronics market in automotive sector. The automotive power electronics market has been segmented on the basis of electric vehicle, vehicle type and application. Based on electric vehicle, the market has been classified into battery electric vehicles (BEV), hybrid electric vehicles (HEV) and plug-in hybrid electric vehicles (PHEV). On the basis of vehicle type, the market is categorized into passenger car (PC) and commercial vehicle (CV). By application vertical, the market is further classified into powertrain and chassis, body electronics, safety & security systems, infotainment & telematics and others. Geographically, the report is segmented into the automotive power electronics market into North America, Europe, Asia Pacific, Middle East & Africa (MEA), and South America; the regions are analyzed in terms of revenue and volume generation. Furthermore, the study also includes quantitative analysis of the competitive scenario for region wise prominent countries which are covered in the report include the following - the U.S, Canada, Germany, France, the U.K., China, India, Japan, Australia, GCC, Brazil and Argentina. The market size and forecast for each region has been provided for the period from 2015 to 2025 along with the CAGR (%) for the forecast period from 2017 to 2025. The report also includes key industry developments in the automotive power electronics market. The report also covers segment wise, market attractiveness analysis and market positioning analysis for all regions covered in the scope of study. The report also includes competition landscape which include competition matrix, market position analysis of major players in the global automotive power electronics market based on their 2016 revenues, profiling of major players. Competition matrix benchmarks leading players on the basis of their capabilities and potential to grow. Factors including market position, offerings and R&D focus are attributed to company’s capabilities. Factors including top line growth, market share, segment growth, infrastructure facilities and future outlook are attributed to company’s potential to grow. This section also identifies and includes various recent developments carried out by the leading players. Company profiling includes company overview, major business strategies adopted, SWOT analysis and market revenues for past years. The key players profiled in the global automotive power electronics market include Infineon Technologies AG, Texas Instruments, Inc., ON Semiconductor Corp., Maxim Integrated Products Inc., NXP Semiconductors N.V., Qualcomm, Ins., Renesas Electyronics Cor., Robert Bosch GmbH, Mitsubishi Heavy Industries Ltd., Vishay Intertechnology Inc.